Camouflage Lanyards: Camouflage Print Lanyards, Concealing Colors or Patterns Printed CAMO Lanyards. Camouflage lanyards are pre-printed lanyards with concealing colors, arts or concealing color patterns. The camo lanyards or camouflage lanyards are printed with dye-sublimated camouflage patterns on both sides of the lanyards. Our standard camouflage print lanyards come with heavy duty nickel color swivel hooks, badge clips, key rings, or cell phone connectors. Camouflage print lanyards also come with a variety of optional hardware attachments, such as safety break-away buckles, heavy duty nickel color, gold, antique brass or black nickel color snap hooks. The camo print lanyards are good for zoo's gift shop resale stores, kids party, outdoor adventures, school or events fundraising, promotional giveaway for events or conventions, as gifts, or as fashion name badges to wear. Camouflage lanyards with the cell phone attachment can be used to carry camera, cellular phone, USB flash memory cards, flash drives, CD, iPod or MP3 players, flash lights, small meters, and electronic devices etc. Please check our online catalogs for more cool camouflage art lanyards with camouflage prints. Just like our camouflage print lanyards, there are a variety of other products on the market come with camouflage prints or camo patterns, such as camouflage print blankets, clothing, hats, gaiters, gloves, bandanas, jackets, pants, socks, boots, shoes, jars, hand painted ceramic, pillows, bath towels, underwear, T-shirts, hats, cups, color toys, cars, airplane, games, clip arts, fabrics, aprons, decorative accessory items and more. Most animal species in the world have developed some sort of natural camouflage that helps them find food and protect them from predators. The concealing technique of camouflaging varies considerably from species to species. Soldiers often wear special camouflage clothing and smear mud on their faces at night to become less visible. Animals basically use one of two methods to conceal themselves in nature: general resemblance and special resemblance. With general resemblance, animals use color to blend in with their habitat so that they're almost invisible, such as hares, tree frogs, flounder fish, grasshoppers, and lizards. With special resemblance, animals use a combination of color, shape and behavior to help them appear like something in their habitat. They are simply mistaken for something else. The walking stick is a great example, due to the shape of its body, its coloration and its slow movement, the walking stick becomes almost invisible. The camouflage lanyards are good for military, climbing, camping, hiking, hunting, fishing and outdoor adventure. Specifications: Camouflage Lanyards: Camouflage Print Lanyards, Concealing Colors or Patterns Printed CAMO Lanyards or Gift Shops Supplies. 1. Standard Width of Camouflage Print Lanyards: 5/8". 4. Standard Colors of Webbing/Straps: Camouflage Prints. Optional: Any Pantone PMS colors with a minimum order of 5000 pieces or more. 7. Way of Pre-Printed Patterns: Dye sublimated on both sides with camouflage prints. 8. Custom Imprinting: Use the camouflage print patterns as back ground. Any customized or personalized logo printed on camouflage lanyards available. Can be use as camouflage print neck lanyards or camouflage print wrist lanyards for ID name badges, dog leashes, tools holders and as shoulder straps for handbags, bags, or purses. 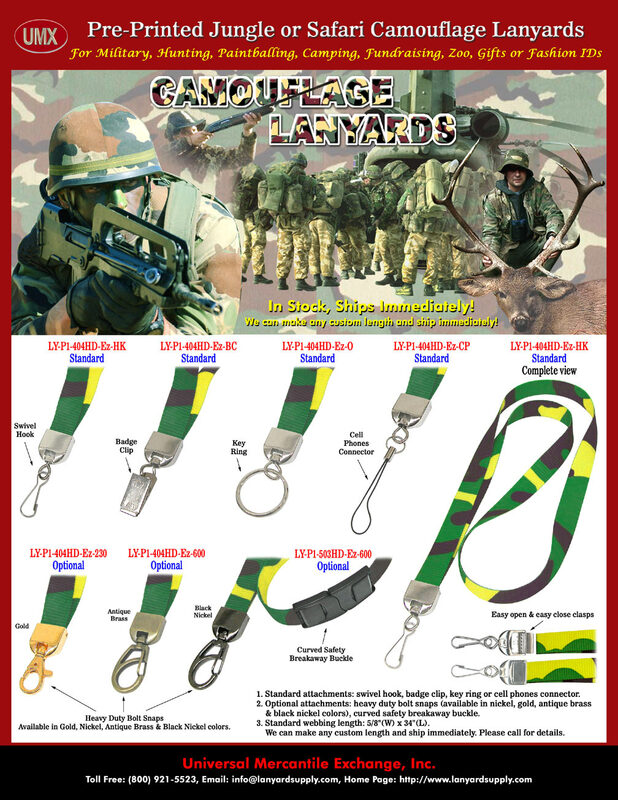 You are viewing > Lanyards > Ez-Adjustable Neck Wear Models > Camouflage Lanyard: Camouflage Print Lanyard, Concealing Colors or Patterns Printed CAMO Lanyard or Gift Shop Supplies.